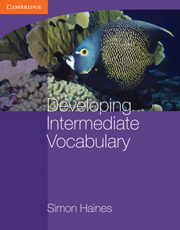 Stimulating vocabulary practice and development books at the intermediate level. This book enables intermediate-level students to discover, learn and practise words and phrases in authentic contexts. It helps develop an awareness of a wide range of vocabulary, including collocation, word-building, topic vocabulary, phrasal verbs and idioms. The book is suitable for use in the classroom, for homework or for self-study. Key features include: 20 topic-based units with authentic texts chosen to capture students’ interest; a wide range of practice and extension exercises; a particular focus on collocation and word-building, plus exercises on phrasal verbs and idioms.